NeoCash Item Trading: The Whats, Whos and Hows?! Welcome! If you are here, you have made your first step into the wacky, wonderful and active world that is NeoCash Item trading. It doesn't matter what your article is about, so long as you are knowledgeable about the topic and your advice is sound. The other day I ate a Jhudora Jelly. Before bedtime. The item description tells us this jelly is NOT toxic but made out of just lime. So I ate my perfectly harmless, before bedtime snack and settled down into dreamland. So you'd like to become a worm extraordinaire, eh? Well, I can tell you now that it won't be easy. 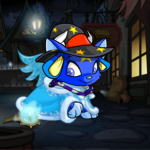 You run to the 'Create A Neopet' page screaming excitedly, select your species and... Disaster strikes. "The name Fang is taken." "I still can't believe that they delivered our stuff and just left it on the lawn! Either Mystery Island is even more backwards than I'd thought, or we chose the wrong moving company." It was 8:00 PM as I was heading downstairs to grab a sandwich. From the kitchen, I could hear the kid's voice chatting away.